Take fishing vacations like Tenerife locals by Puerto de la Cruz. Indeed, some have them by the harbor of Puerto de la Cruz. The picture beside shows a big orange rubber dingy. This boat is used by a good local club for diving school outings. Similar boats are taken out for holiday fishing, mostly for private use. Discover wooden boats, too. They belong to professional fishermen. Make out two people swimming next to the orange boat! There are absolutely no such records. Catch your own very fresh fish which some do in this harbor. There, see Cazones caught which are local miniature sharks. A young lady whom I know enjoys vacations for fishing partly as a hobby. She prefers them in more remote spots, though. She works in a Tenerife financial institution in Puerto de la Cruz and uses all its bank holidays for fishing trips. For example, any long weekend, such as the Canary Islands holiday called Dia de Canarias on May 30, which always works out as an extra long weekend serves her well. She plans her own fishing outings. She and her boyfriend don't only go for best Tenerife fish. They like to discover different creatures of the sea around all Canary Islands. They were on fishing vacations in La Palma, La Gomera, El Hierro, Fuerte Ventura, Lanzarote and even Gran Canaria. They don't fish on the high seas, as far as I know. They like romantic getaways, though. 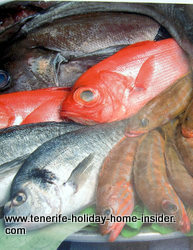 Fishing trips to the Tenerife province el Hierro or on home grounds. The coasts of the Island El Hierro are the most intriguing for diving and for gathering interesting seafood. Of course, it helps much that the lady's boyfriend his local. He knows more than best Tenerife fishing grounds, which could even be close by, such as a little spots out of the way in Puerto de la Cruz. great fishing fans try out new bait to catch bigger fish. Here I need to correct myself after speaking to the young lady's mother. The fish which they bring her most is found near shores. It's the popular 'Tenerife Vieja'. Locals lure it best with tiny crabs, such as the Caja. By the way off the beaten track, such as the Punta Brava hamlet backyard, has rather dangerous Tenerife fishing grounds. Some guys fish there for nearby renown seafood restaurants. Wondering about fishing bait tips? My young friends flyfish with modern rods and fish lines. Heard of leather fish lines (Cuero de cabra)? Asians were known to fish with silk lines. Others even used cotton. The modern world uses all sorts of synthetics. 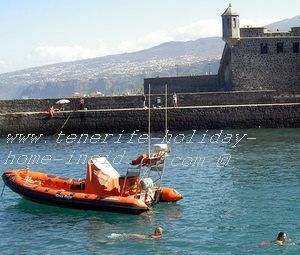 Well, there is a peculiar ancient Tenerife custom to flyfish with lines which are painstakingly made of goat leather (cuero de cabra). It is always used with bamboo rods but, such traditional Tenerife fishing lines cannot be bought for love or money. They are priceless. First class permit: From sports boats at least 3 nautical miles from beaches and coastlines. Click here to get a recreational fishing license for your vacations. Want your fishing permit fast? That's very easy and should be fun. Go to the office of Multiple Usos in the capital Santa Cruz. The Multiple Usos is a stone throw from the Tenerife Military museum a free must see, by the way. There is also a Chinese restaurant opposite with a big red dragon. I think that it still says 'Multiple Usos' in big letters on the house front when you walk under trees along the shore there and look up to one of the last big buildings over the road. Where have your base for Tenerife fishing trips? Best use self catering Tenerife accommodation, such as a Tenerife villa or at least any of Tenerife apartments. Of course, your own Tenerife apartment may be ideal, where garden and pool maintenance is taken care of already. Of course, not to forget is el Medano Tenerife South where many locals from the capital Santa Cruz and the north of the Island have holiday homes. There, Tinerfeños love their flyfishing, where very young fishing boys or fisher girls are not unheard of. Otherwise, keep everything you need for your fishing trips with friends whom you have on other islands. It helps to make friends who have the same sports fishing hobby. Also, keep a fishing vacation log book to keep track of all your fishing vacation experiences, your fishing trophies, highlights, water fun and all other fish catching incidents. Go to Puerto de la Cruz to find accommodations closeby for any fishing adventures. From fishing vacations back to Tenerife fishing with info on fishing spots, bait, shark fishing, cazones, flyfishing and an excellent fish restaurant.